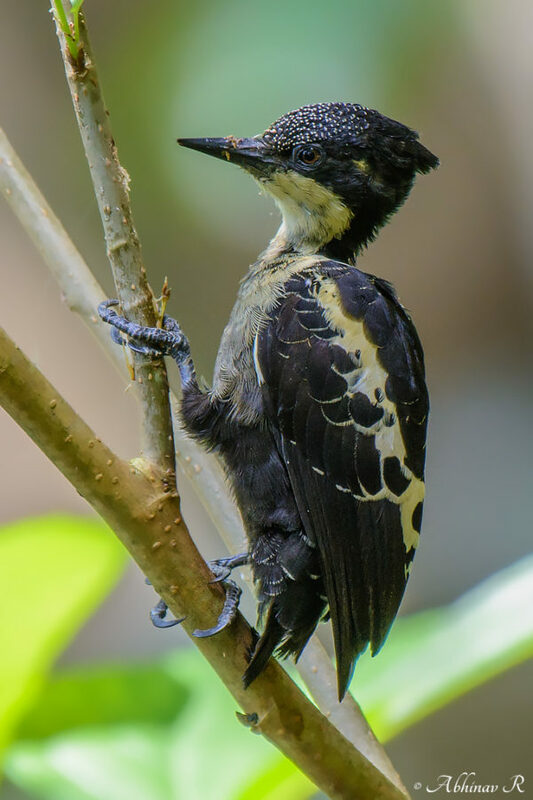 Heart-spotted Woodpecker is a small woodpecker with black and white colors. The bird is not uncommon in Kerala. Its distribution is fairly wide in Asia. In India, the Himalayas and the Western Ghats are the main regions. Exif- f/5.6, 1/160s, ISO-400, +0.3 step, 500mm, Nikon D7100, Nikon AF-S 200-500mm f/5.6E. Date- Sep 10, 2016. Location- Cheruvally, Kerala (both Photos 1 &2). Both the photos are from Cheruvally, near to my home. They make occasional visits here. It was one such visit when these photos were made. The male bird was busy searching on the bark of a hibiscus plant, while the female came and perched on a nearby branch above it. I got some time to watch them and click a few shots before they moved to another tree. Out of the bunch of pictures made that day, these are my favorites. The male and female birds differ each other in appearance. 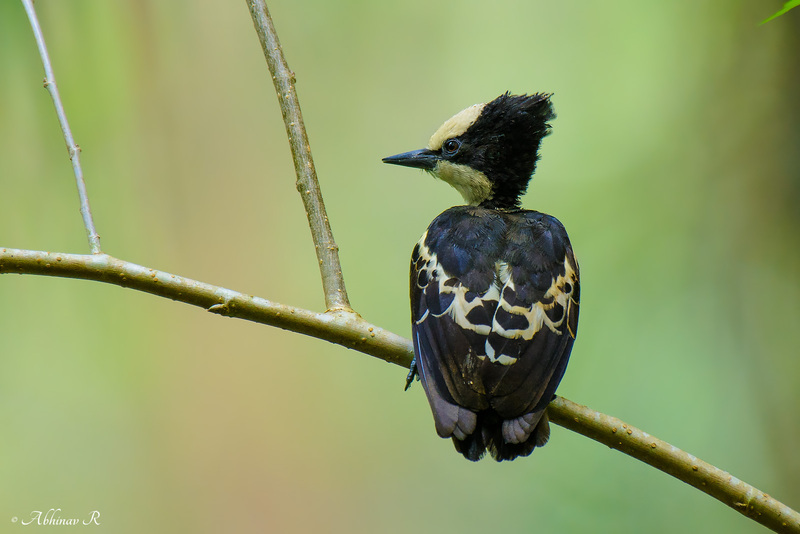 The female has a white forehead whereas the male has black forehead with white spots. The pointed head is large compared to the body. The crest, bills, and neck region are also black. The throat and chest region are white. The belly region is grey to black. The white and black spots on the wings (when closed) forms the shape of a heart. That may be the reason behind its name. Although common, Heart-spotted woodpecker is not as frequently seen as the Black-rumped Flameback woodpecker. The former is usually seen more near the forests. This woodpecker is usually seen in pairs. Their calls are distinct. These are very active birds and flies swiftly.